The 20-kilometer gas pipeline section from Lozenets compressor station to Nedyalsko is being implemented in order to increase the security and capacity of the existing transit gas transmission network. Following the expansion of the pipeline, through the connection natural gas transit capacity will be increased from 14 billion cubic meters to 15.7 billion cubic meters per year. In addition, it will be possible to transfer blue fuel in the opposite direction as well – from Turkey to Bulgaria. The activities carried out by Glavbolgarstroy are part of the project for rehabilitation, modernization and extension of the gas transmission system, designated as a project of common interest to the European Commission. 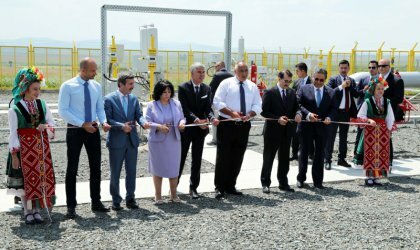 The event was attended by Prime Minister Boyko Borisov, Energy Ministers of Bulgaria and Turkey Temenujka Petkova and Fatih Donmez, as well as representatives of Bulgartransgaz and Glavbolgarstroy. Thanks to the effective co-operation with Turkey, the project was finished 4 months earlier and with less funds than expected.